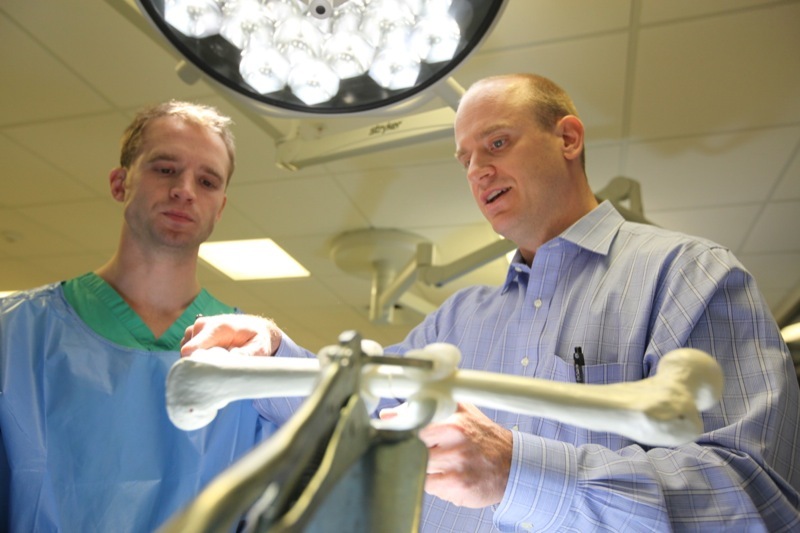 Todd Ritzmann, MD (right), works with a student. 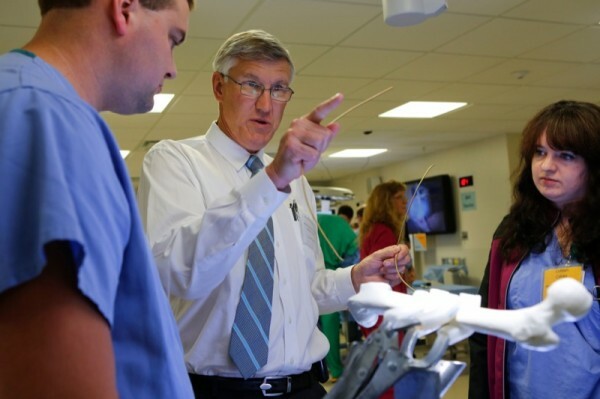 Working with synthetic “saw” bones and cadavers, about 80 orthopedic residents from Ohio and Pennsylvania recently received 2 days of hands-on training led by Akron Children’s nationally-ranked pediatric orthopedic surgery team. “The old mantra for doctors in training, ‘See one, do one, teach one,’ no longer seems adequate in the ever-changing world of medicine, especially with reduced residency hours,” said Dr. Todd Ritzman, a pediatric orthopedic surgeon and director of education for Akron Children’s department of Pediatric Orthopedics. The Akron Pediatric Orthopedic Resident Review Course was held Oct. 4-5 at the Austen BioInnovation Institute in Akron (ABIA). The 2 days included lectures and skill labs giving the residents experience in how to care for kids with club foot, curved spines (scoliosis), fractures, bone tumors, and various genetic disorders of the bone. Most important, though, is patient safety and giving residents the hands-on training they need in a safe, simulated learning environment. “You can certainly get a foundation from textbooks and lectures, but this is one of those things where you have to do it to learn it,” Dr. Ritzman said. Joining Dr. Ritzman in leading the workshop were Drs. Kerwyn Jones, Mark Adamczyk, William Schrader, Sheryl Handler-Matasar, Pat Riley, Ken Bono, and Dennis Weiner. Akron Children’s ranks among the top 25 pediatric orthopedic programs in the country, according to U.S. News & World Report. 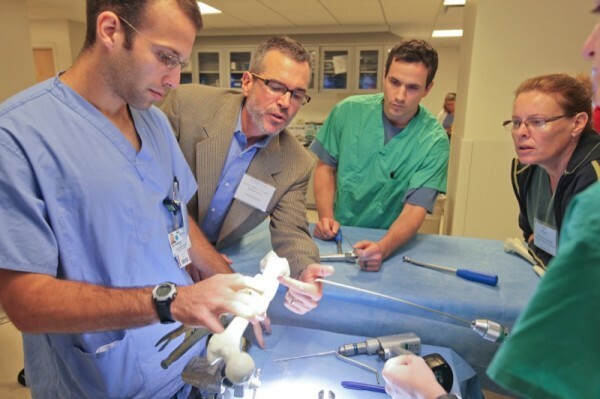 The course followed the Pediatric Orthopaedic Society of North America (POSNA) resident curriculum and the Orthopedic Surgery Milestone Project from the Accreditation Council for Graduate Medical Education and the American Board of Orthopaedic Surgery. Dr. Ritzman hopes it is an annual event, and that, through POSNA, is offered in other areas of the country. Participants paid $100, thanks to a donation from the Akron Children’s Hospital Foundation’s Ziegler Endowment, as well as financial support from several medical device companies. Typically, a program of this type would cost $1,000. A key player is the ABIA, of which Akron Children’s is a founding partner with Akron General Medical Center, Summa Health System, the University of Akron and the Northeast Ohio Medical University. With financial support from the Knight Foundation and FirstEnergy Corp., the ABIA was created in 2008 to boost medical-related economic research and development, job creation, education, and community health initiatives.